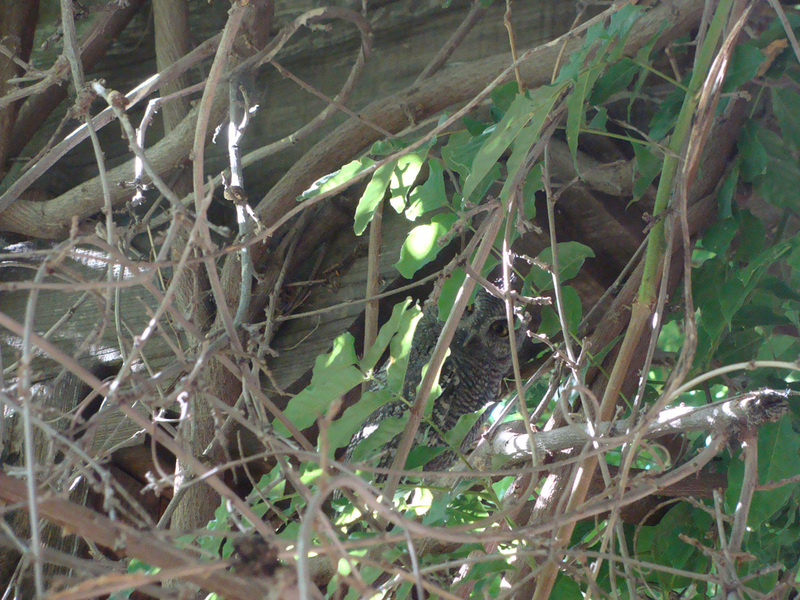 More Owl Camouflage /Hawks Aloft Inc.
Western Screech-Owl nestled in a cavity. Photo by Doug Brown. 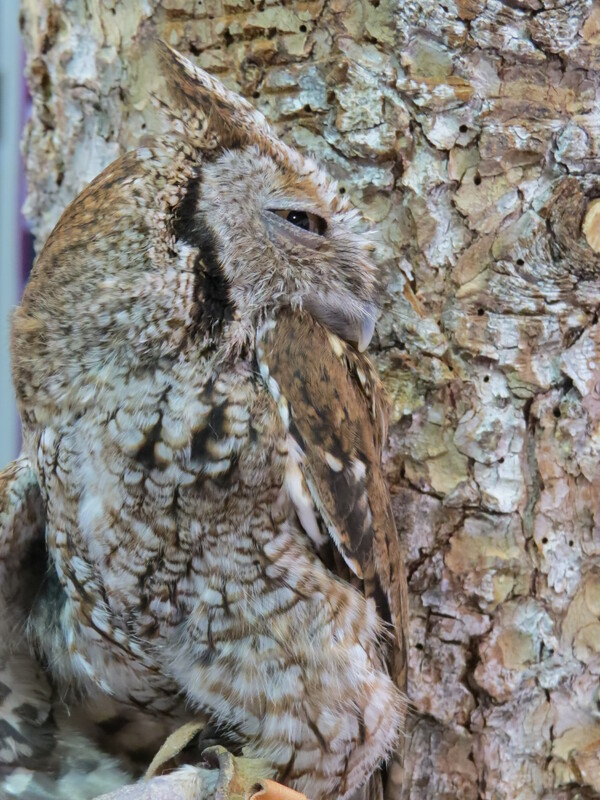 This Western Screech-Owl seems pretty obvious against the reddish bark of this tree. 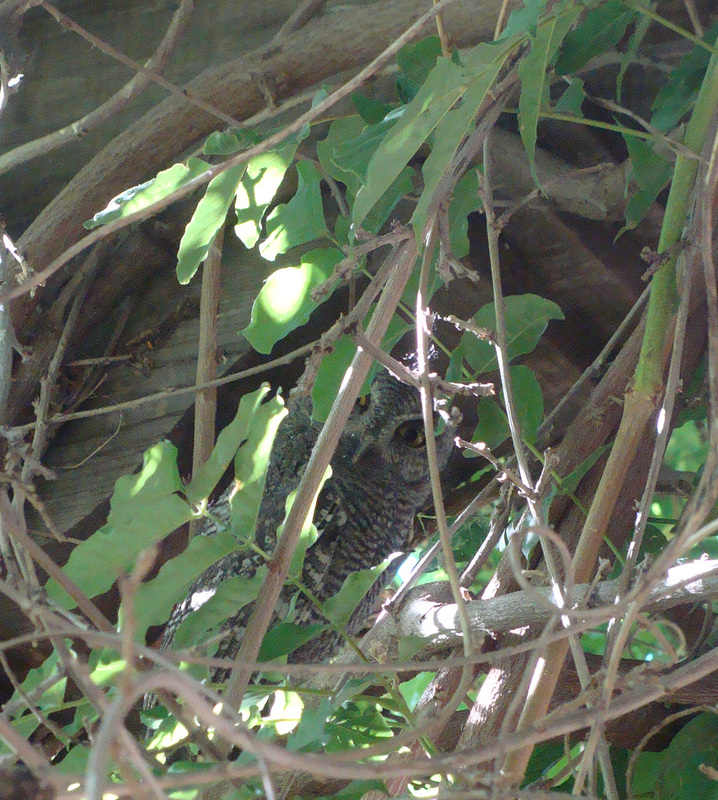 Generally, owl plumage matches the color of the environment in which they live. For instance, Great Horned Owls that live in a coniferous forest tend to be darker and grayer, while desert dwelling Great Horned Owls tend to be more of a sandy brown color. 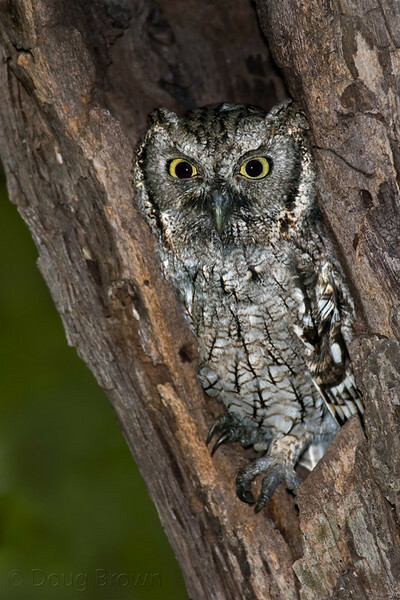 The Western Screech-Owl is commonly found in deciduous riparian forests of western North America. The most common large tree in these forests is the cottonwood which has a gray bark that perfectly matches the owl’s plumage – or should that be the other way around? Can you see the owl? Image by Wendy Brown. In this photo, the Western Screech-Owl largely matches its background. It would be difficult to see unless one were looking closely. Of course, I helped by cropping the image so the owl is more obvious. Here’s what the image looked like before cropping. At Hawks Aloft, we try to display our educational ambassadors in the most natural way possible. Our small owls are generally perched on a table top in easy view of the attendees, and we just thought it was time to find a more natural way to display them. So, we came up with the idea of making a tree perch with bark that matches the color of their plumage so viewers can see just how well camouflaged owls can be. Below is our first attempt with our red phase Eastern Screech-Owl perched on it. Can you see me? Photo by Mike Quaintance.